Today I'm sharing the holiday card that I mass produced to send to family and friends. I have to admit that the card almost didn't happen. It's been a busy and stressful fall. I went back to school in September to start work on my certificate in school administration and supervision, taking two accelerated schedule masters level classes during the semester in addition to working my regular full time job, and there have recently been some changes at work that have left some things up in the air and created lots of stress and uncertainty beyond the usual level of stress that the job brings. With all of that, I just wasn't feeling like getting cards done, but I pushed myself to do it. Not my favorite holiday design of all time, but it worked! 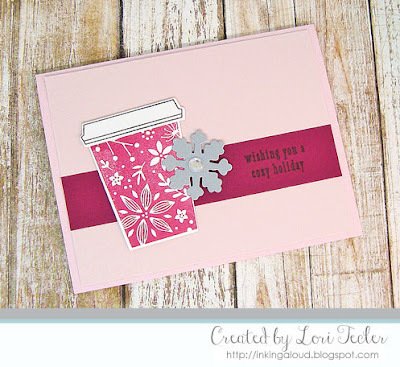 I used the Coffee Cup Tags stamp set and dies from Hero Arts along with a pretty snowflake die from Clear and Simple Stamps to create the card. I added a clear crystal to the center of each silver snowflake for a bit of sparkle. I was a little worried that the crystals would be an issue with mailing, but it seems that my cards got to their destinations just fine! If you are celebrating Christmas today, I hope that you have a wonderful day filled with family, friends, and love!